GIMP is a great tool for making comics, especially when combined with my little GIMP Book plug-in, which provides a simple tool for managing multiple pages. In this first tutorial in a series on Making Comics With GIMP, we’ll use GIMP Book to set up a template page for our comic. It’s important to spend some time on this template, and make doubly sure that the resolution, margins and size are all correct, as this will be the basis for all the pages of our comic book. The first thing you need to do, is to decide on what form your comic should take. Is it a web comic, or are you aiming for print…or both. If aiming for print, you need to decide on what format the book will take; is it a black and white manga, a typical four color action comic, or a full color bande dessinée. For this tutorial I’ve chosen a 7″x10″ full color book aimed at print, at around 64 pages. I’m using print specifications from Createspace, a print-on-demand service, as a reference. If you know beforehand where you’ll be getting your book printed, it’s a good idea to get exact specifications from your printer, which defines the resolution, trim size, bleed and so on. For some of my web comics, I’ve made them half pages. This way, they better match the aspect ratio of most computer screens, but if I want to print them later, I can combine two half pages, one above the other, into one 7″x10″ page. The yellow area is the bleed, the green area is the margin and the red line indicates the trim size. Notice that the first panel goes all the way to the edge of the canvas, and into the bleed area. When a book is printed, it’s generally printed on paper that’s larger than the final size of the book, and it’s then trimmed down to size. This is what’s called the Trim Size. For my example book this is 7″x10″. The trimming process is not 100% exact, so the minimum margin defines how far from the edge of the page it’s “safe” to put important text or artwork. The outside margin is for the top, bottom and outside edge of the book, while the inside margin is in the fold. The inside margin varies depending on the thickness of the book, as more paper is lost in the fold on thicker books. Note that this is the minimum margin, and you can of course chose to make the margins of your book wider if it suits your design. If you want to have drawings that go all the way to the edge of the page, you need to include a bit of extra artwork that will be trimmed away. This is called the bleed. If you were to draw only to the trim size, you would risk getting a thin white edge around your artwork if the page is not trimmed in exactly the right place. In my example, the bleed is 0.125″. The bleed is not applied on the inside edge of the page, as the fold doesn’t get trimmed. When initially setting up pages for a comic, I like to make them symmetrical. This is because I don’t know until relatively late in the process, if a page will be on the left or right hand side, so I don’t know which is the inside or outside margin. The numbers I got from Createspace conveniently add up, as the inside margin is equal to the outside margin + the bleed. This means we can make the bleed 0.125″ all the way around, and if we were to go with the minimum margin, we make it 0.25″ all the way around, adding up to a total of 0.375″ margin+bleed around the page. Personally I like to have slightly wider margins at the top and bottom of a page, than on the sides, and a wider one at the bottom than on the top. So for my example book, I’m going with side margins of 0.5″, a top margin of of 0.6″ and a bottom margin of 0.7″.When you export the book from GIMP Book, you can choose to crop or resize the canvas on the inside or outside edge of the page, making it asymmetrical if you want to. Resolution is defined by the number of pixels per inch (ppi). For instance a 10 inch tall page, at 400ppi, will be 4000 pixels tall (10×400=4000). In general higher resolution is better as it makes your art look sharper, but you don’t want to go so high that it slows down GIMP and becomes hard to work with. For a printed color comic, 400ppi is a nice middle ground between quality and how heavy the images are to work with. For photos, anything over 200ppi is usually fine, but comics contain both sharp lines and text, so 400ppi helps keep these crisp and sharp. This means that my sample book at 7″x10″, with the addition of 0.125″ bleed on all sides, will be 2900×4100 pixels ((0.125+0.125+7)*400=2900 and (0.125+0.125+10)*400=4100). This is quite a high resolution to work at, especially when working with multiple layers, so this would be a good point to adjust your Tile Cache settings to get the optimal performance out of GIMP. For web comics, even though your output resolution will generally be lower than for print, there are still good reasons to draw them at a higher resolution. For one, the pixel density of computer screens has been steadily increasing in recent years, so your average screen will probably have a pixel density between 200 and 400ppi in the near future, at which point you’ll want your web comics to still look good. Secondly, even though you’re drawing a web comic now, you may want to print it at some later date. So for future proofing your web comics, aim at print resolutions, then scale it down as needed when exporting .jpg’s for your website. For pure black and white line drawing, it’s the A on the left that we want. At very high resolutions, the jagged edges look smooth to the naked eye. Black and white comics, like a lot of indy comics and most manga, are somewhat of a special case. For the best result the original should be a 1-bit image where all the pixels are either completely black or completely white with no anti-aliasing, and the resolution should be at least 600ppi for crisp and sharp lines. GIMP, or Photoshop for that matter, isn’t really designed for this, even though it can be done. Working with black and white line art in GIMP is probably a subject for a tutorial all of it’s own. Now that we have all the numbers, we just need to put it all together in GIMP Book. Start by opening up GIMP, and choose Windows>Book… from the menu. 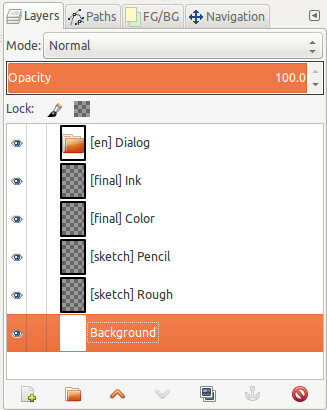 This opens up the main GIMP Book interface. Choose New Book from the menu, and enter the name of your book and choose a destination folder for it. Then set the width to 2900 pixels, the height to 4100 pixels and the resolution to 400 ppi. Next we want to add some guides to our page, that show us where the margins and bleed are. Since GIMP Book (for now) only accepts pixels as input, and not inches, I need to do some simple math to convert my chosen margins, to pixels. The side margins were 0.5″, which is 200 pixels (0.5*400=200), the top was 0.6″, which is 240 pixels, and the bottom 0.7″, which is 280 pixels. Finally the bleed is 0.125″, which is 50 pixels. Enter these values in the appropriate fields and hit OK.
We now have a new book with a single template page. The first thing we want to do, before we begin adding pages to our book, is to tweak the template page. Double click the template to open it. It should have two paths that indicate where the margins and bleed are. These we can use for reference when drawing, and to help with panel creation later on. Since all future pages are generated from this template, it’s a good idea to set up a few basic things we know we’re going to need on every page of our book, such as a set of default layers. You’ll notice that most of the layers have text in square brackets in their names. These are tags, which can be used to either hide or show those layers when exporting from GIMP Book. They can for instance be used to create multiple translations of the comic in one file, by tagging layer groups containing text (e.g. [en], [fr], [is]), and then hiding or showing them on export as needed. Once you’re happy with the template you can save and close it, and finally begin working on your comic book….which is probably what I should be doing too. If you want to learn more about preparing comics for print, check out Offset printing for comics artists by Majnouna, over at DeviantArt. Continue on to the second part in this series, Making Comics with Gimp – Panels and Gutters. Posted in Tutorials and tagged comics, gimp book, making comics, print, tutorial. Hey, I haven’t attempted to retrieve your plug in yet, just wondering if it will still work with Gimp 8.22. Also wondering if there are any updates to your info at this point. I’ve just started working on a promotional comic book for a local area high school career center. I will be working with the Surface Pro 4 and Gimp as much as possible. Sorry for a very late reply. I’ve been neglecting my page a bit lately. I see no reason it shouldn’t work with Gimp 2.8.22, though I think the latest version I’ve tested it in is 2.8.16. Gimp tends to be quite stable with these minor updates, and not break stuff. I do know that there is a small bug with using it in the latest development builds, at least I found one when I last compiled Gimp from source, but I’ll try to fix these before these versions of Gimp are out. Good luck with your comics project. 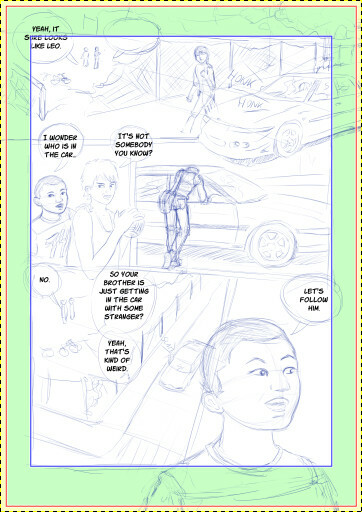 It’s awesome to see people using open source tools to create comics. You might also want to keep an eye on the upcoming release of Krita 4. They’re doing a lot of work on vector layers and the text tool, which is handy for comics. And it will include a comic project management docker, somewhat similar to Gimp Book. Please how do i install your book plugin on my GIMP? Note that I haven’t tested it with the latest GIMP 2.10, so there may be some issues there. Hey thanks for the great tutorial. I just installed the new OS X native GIMP on a 2011 MacBook Pro – will your plug in work on Sierra OS? template. I was able to drag the art work to the panels and crop/scale in PS. Can I do that in gimp?